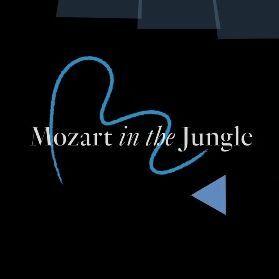 The second season of Amazon’s Golden Globe–nominated comedy Mozart in the Jungle opens with classically arranged strains of Phoenix’s song “Lisztomania,” just like the first season did. But this time, there’s a twist. Each of the ten episodes features a different short, playfully abstract animated title sequence, created by designer Teddy Blanks, co-founder of Brooklyn’s CHIPS Design Studio. “The idea I pitched was to make colorful animations inspired by abstract geometrical classical album covers from the ‘40s and ‘50s, particularly those designed by Alex Steinweiss,” Blanks wrote by email. Swirling lines intersect with blocky shapes, each keyed to a specific instrument in the score. The titles for earlier episodes are more spare, but as the episodes near the season finale, they become more complicated, eventually combining for a culminating, richly orchestrated — and animated — final sequence. Watch the intros for all ten episodes above. Blanks is friends with Jason Schwartzman, who is one of Mozart’s executive producers, along with Roman Coppola and Paul Weitz. He also lent his imaginative, retro aesthetic to the trippy titles for this summer’s Brian Wilson biopic Love & Mercy, and Alex Ross Perry’s films Listen Up Philip (starring Schwartzman) and Queen of Earth (starring Elisabeth Moss), as well as HBO’s Togetherness, the cover of Lena Dunham’s memoir Not That Kind of Girl, and a number of other projects. Curious about how he conceived of and created the animations for Mozart in the Jungle, Vulture asked Blanks a few more questions via email. Why is good title design important? A good opening-title sequence can simultaneously set the tone for the action that follows and exist as a delightful, evocative work on its own. Titles for a TV (or streaming) show come on at the beginning of every episode, and through repetition, they become a big part of what gives a show its identity. For example, Cheers opens with slow-moving archival photography and illustrations of people in bars; it sets you up to think the bar in the show has been there forever. Even the decision not to do an opening-title sequence can have an impact. The opening title for HBO’s Girls is just the word by itself, bold and all caps, filling the screen for two seconds. It’s a punch in the face. What’s your process in coming up with the animations that will go along with the music — is there a logic or pattern to it? Jason, along with the composer, Roger Neill, and the orchestrator, Suzie Katayama, came up with the idea to make ten different 15-second-long orchestral arrangements of the theme song (Phoenix’s “Lisztomania”). Then, after a series of lively phone discussions, Jason and I landed on the concept for the animations, which was that each group of instruments would be represented by a different shape. So, whenever you hear a harp, there are a lot of triangles on the screen. Whenever you hear a horn blow, there’s an expanding circle. Do you scribble by hand or work with a computer? The first thing I’d do after being sent a new piece of music was sit and play it over and over again, listening carefully in order to pick out each individual instrument. Then I would fill a sheet of paper with a bunch of dots and squiggles, mostly so that I could remember how many notes each instrument played, roughly how long each note was played for, and if any note was dramatically higher or lower in pitch than the one it preceded. I would use that scribbled page as a guide, and make a flat illustration on the computer with all the different shapes I would need for the intro, making some initial decisions about color and placement. Then I would start animating!